Pneumatic or Cordless Brad Nailers? Which do you prefer? For me, I prefer cordless brad nailers as it means I don’t need a heavy air compressor to run the item. I used to think that a battery-powered tool will never match a pneumatic tool when it comes to reliability and sustained power. But after using some of the best cordless brad nailers currently available, I have changed my mind. Cordless brad nailers now not only offer greater flexibility and portability, they are also integrated new advanced technologies in battery and the brushless motor that allow the tools to hold a lot of power and pack a serious punch when called into action. I was very impressed with the new line of lithium-ion batteries which are smaller and lighter than their nickel cadmium (NiCad) predecessors, and won’t run out of juice before my work done. The best part of owning a cordless brad nailer is that I can always use it in tight spaces, where a corded one can’t reach. I can also place it in my toolbox and take it with me anywhere I go. The convenience makes me feel I can do everything better with less effort. I know a cordless brad nailer always costs much more than a pneumatic model, but that is what we have to pay for the convenience. When it comes to choosing a battery-powered brad nailer that is versatile and tough enough for most major woodworking projects, there is no one better than the DEWALT DCN680D1 20V Max 18 Gauge Angled Brad Nailer. This is an upgrade version of the DEWALT DC608 18V 18-Gauge Cordless Brad Nailer – which came out in 2007 and has quickly become one of the most popular cordless brad nailers so far. I think Dewalt listened to their customers and tried to add more advanced features to this model. Making it the best cordless brad nailer for most homeowners and contractors. The DEWALT DCN680D1 comes as a kit, including the Dewalt DCN680B Brad Nailer, one 20V-2A Lithium-ion battery and charger, and one kit bag. The gun is slightly bigger and heavier than a pneumatic one (6 pounds with battery) but I do not find any inconvenience when I have to work with it all day long. It is compatible with all Dewalt 20V MAX batteries. So if you already own a bevy of cordless DeWALT tools and have ample batteries, you may want to purchase the bare model. The key feature of the DEWALT DCN680D1, as most Dewalt cordless power tools, is the Dewalt’s most advanced brushless motor. This feature helps reduce significantly overall tool weight and gives better battery mileage, and should provide a longer tool life. According to Dewalt, their brushless motors can deliver up to 57% more runtime over other brushed motors. Compared to Dewalt DC608, the new brushless motor is much stronger and faster. It can drive nails with the speed and consistent power of the best air-powered nailers. How good is the battery life? This is one of the most common questions when it comes to cordless power tools. 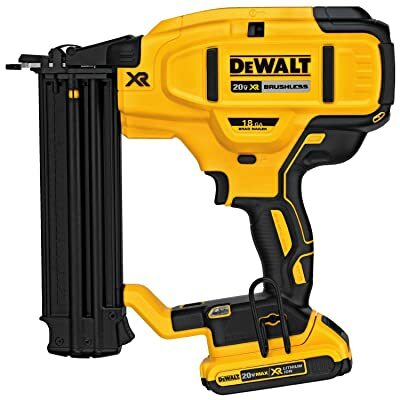 I think a Dewalt 20V 2A battery would be fine for most occasional projects at home (600-800 nails per charge), but for projects that require more than two hours using your brad nailer, you’ll need a 20V/4A battery for a longer runtime. Overall, the DEWALT DCN680D1 exceeded all my expectations. You can’t go wrong with it. 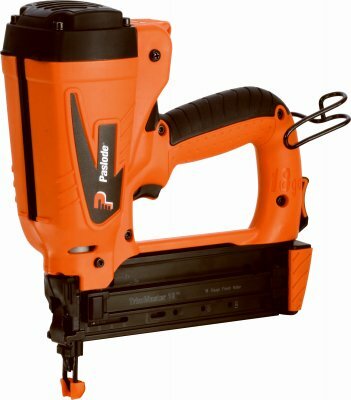 The second best cordless brad nailer in my comparison is the Paslode 918000 Cordless Li-ion Brad Nailer. Do you know that this nailer can drive up to 12,000 nails per charge? What a huge number! I found that it’s more robust and much lighter (only 4.6 lbs with battery) than the Dewalt. But there is one thing that makes me prefer the DEWALT DCN680D1 to this one. It’s the fact that the Paslode 918000 is still using gas and gas freezes in cold climate. The small size and cordless free design allow this nailer to fit into any tight spot you might find. Not to mention it’s easy to transport, allowing you to work wherever you need to. A reversible belt hook can be adjusted for use with either your left or right hand, giving you the convenience of free hands when you need them. The feature that I love most is its battery. A 4V Li-on battery lessens your downtime with 12,000 nails per charge, compared to 800 nails per charge of the Dewalt. So you won’t need the second battery, even during all-day jobs. Overall, I think if you don’t mind the hassle of using gas, the Paslode 918000 Cordless Li-ion Brad Nailer is the best choice. 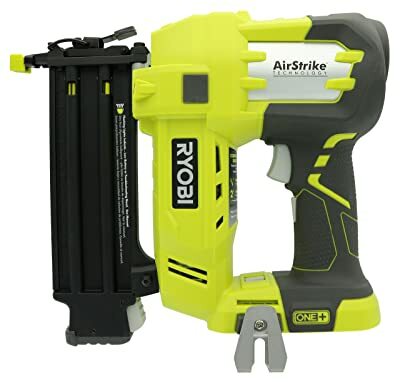 The Ryobi P320 Airstrike 18-Volt Cordless Brad Nailer is the best cordless brad nailer for those looking for an inexpensive model to work around the house. I recently had a chance to try it and I have to admit I was surprised at how well it performs. And I was also very impressed by the way Ryobi did their marketing campaigns. The Ryobi P320 Airstrike is everywhere. According to the Ryobi, the best feature of the P320 Airstrike is its AirStrike System. Here is how the system works: a single piston inside pressurizes ambient air with each trigger squeeze, and that’s what drives the brad. The motor is quiet and the ramp-up time is brief. This nailer sinks even long brads into thick hardwood without unpleasant recoil. You can fine tune how deeply to countersink those nails with a large air pressure dial on top — it’s unique to RYOBI. Plus, there’s a second contact element adjuster wheel in front to set countersink depths. The Ryobi P320 Airstrike cordless brad nailer is sold as a bare tool. With a 4A 18-volt battery, you can expect to sink about 700 nails per charge. The gun can handle 18 gauge brad nails ranging in size from 5/5″ to 2″ in length. That’s a nice range of brads and is perfect for just about any application. Overall, I think this battery-powered brad nailer is a great option for anyone looking for a good upgrade from the pneumatic brad nailer. But honestly, I won’t buy it if I can afford the Dewalt or Paslode.